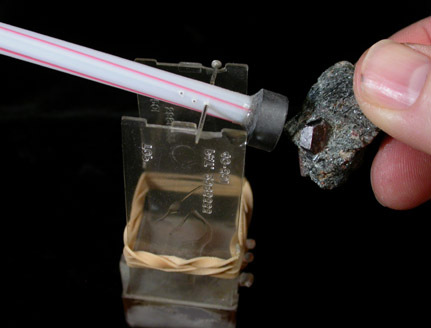 A local mineral collector in the New York area, Mel Pollinger, was showing me his collection one day, when I noticed a simple device cobbled together from a drinking straw and other parts. I inquired what it was. Mel demonstrated that it was a simple balance with a magnet in one end. When no minerals are near, it sits still and level. But if you wave in front of it a magnetic mineral like pyrrhotite, it will respond by following the mineral. Mel gave me a duplicate of the device that he had lying around. I use it regularly and find it invaluable in detecting magnetic minerals, even microminerals. Glue a magnet to one end of a flexible drinking straw. Push a straight pin through the straw at the approximate balance point. Find or build a support bracket with arms separated by less distance than the length of the needle (so they will support the needle). Place the straw/magnet/needle assembly on the support arms. 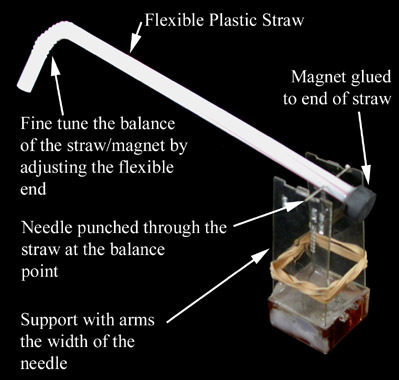 Adjust the flexible end of the straw to fine tune the balance (repositioning the pin might be necessary). Once the straw/magnet/needle assembly are in balance try waiving a magnetic mineral up and down in front of the magnet end. Even slightly magnetic minerals will invoke some motion in the balance arm. This simple device, along with streak plate, hardness kit, and hand lens will be all you need to identify most common minerals.